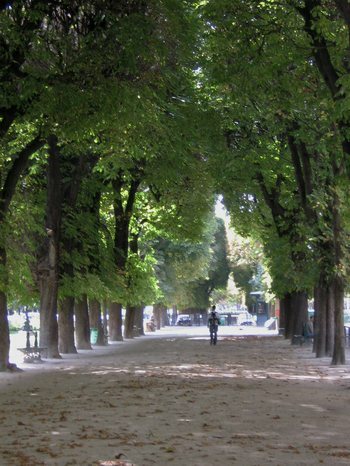 A typical Parisian park “allée,” this one being in the avenue de l’Observatoire extension of the Luxembourg Gardens. 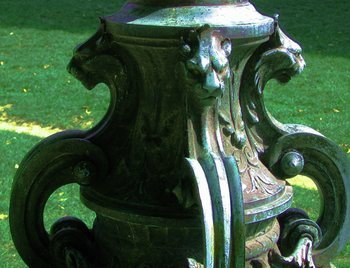 Cats on a lamp base, in the same part of the Gardens. 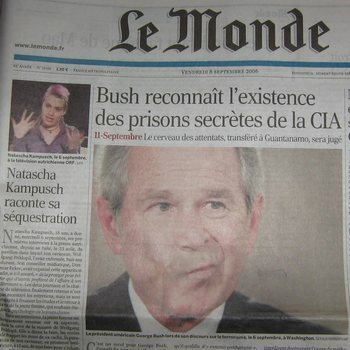 Photograph of President Push on the front page of this past Friday’s issue of LeMonde. Also notice the photo of the intelligent looking Natascha Kampusch, the Austrian teenager who recently escaped from her kidnapper after 8 years of sequestration. Although we already knew the neighborhood around Saint Sulpice from our nine summers of wandering and reading about Paris, we are now getting to know it intimately. Something that impresses me is how very long the restoration work on the exterior of the church has been going on. Now, the entire north side, including the north tower, is engulfed in scaffolding, as it has been for some time. All of the churches built before 1925 are the property of France, not the Church. So, when a massive restoration must be done, the French taxpayers pay for it. Work is scheduled, and money is budgeted. But the budgets are often cut, and the amounts budgeted are not always allocated. I think that this accounts for much of the time it takes to finish these massive restorations. The church must still pay for all the costs of operating the buildings they occupy, even if they don’t own them. This includes routine maintenance, and there are many examples of churches in the city that do not receive proper routine maintenance. But they are beautiful and imposing, nonetheless. On one of our recent wanderings in the vicinity of Bon Marché, Tom and I once again passed the Chapel of the Miraculous Medallion where Sister Catherine Labouré was supposed to have had three separate conversations with the Virgin Mary, and where she allegedly received the design for the Miraculous Medallion from Mary. We never bothered to see when the Chapel is open because we really don’t care much about this. But when we passed by that day, the double doors to the court leading to the Chapel were open, and people were streaming in and out of there. Tom wanted to go in. So we went in, and mixed with all those devout Catholics. We stepped into the very crowded chapel where a service was being conducted in Latin. The chapel was bright inside, with unbelievably gaudy mosaic decorations at the altar end. Lots of gold tiles in those mosaics! Along the court leading to the chapel are several openings. One is for a reception desk. Another is for the place where the medallion is on display. And another is for a gift shop, which Tom entered, and where he discovered that the souvenir medallions being sold there were not very expensive. He came out and asked me if I wanted one. I said no, and that I didn’t want to give any money at all for this cause. I suspect that the money collected here does not go toward maintaining these wonderful, monumental churches, and that it does not go for what I would consider to be humanitarian purposes. I suspect that it is used for pushing a semi-political agenda that does not mesh with my value system. I have no proof, only suspicions. One reason I like the Saint Sulpice church is that I trust its austerity. Its history, of being the church created for the people, the real people who were not allowed to attend the church at the Saint Germain des Prés abbey. I think Hemingway may have liked Saint Sulpice for the same reasons. And to this day, Saint Sulpice is very open to the people. It seems to have more visiting hours than any other church I’ve seen in Paris. Last night we went back to dine at L’Espadon Bleu (The Blue Swordfish) again. Jacques Cagna himself was there, and he came to our table to chat with us. He had not heard of Sanibel Island, but he said he spent at Mar-a-Lago, Donald Trump's exclusive spa for the super-rich in Palm Beach. We explained that Sanibel is on the other side of Florida, north of Key West. Tom asked Mr. Cagna if L’Espadon Bleu was also the name of a boat. Mr. Cagna seemed surprised that he might guess this, and he said yes, it is the name of a boat in Nantucket! I had a wild bass served with little wild mushrooms – perhaps almost the best fish I’ve ever eaten, and I’ve eaten a lot of fine fish. Before that, I had the salad with green beans, and it was lovely, with a fine vinaigrette. Tom indulged in dessert, a homemade apple tart. Superb! And the bread at this fine resto is not to be missed, even if you are on a low-carb diet.